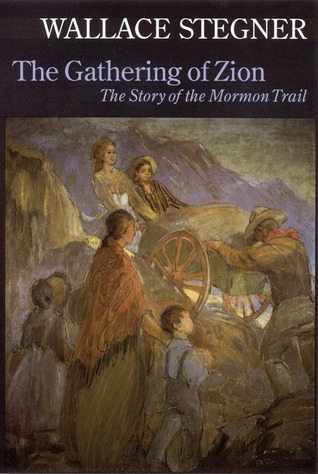 General authorities and auxiliary presidents of The Church of Jesus Christ of Latter-day Saints, including Sr. Bonnie D. Parkin, Elder Quentin L. Cook, and President Gordon B. Hinckley, have all quoted from Wallace Stegner’s The Gathering of Zion: The Story of the Mormon Trail. I figured if our leaders found this narrative of the Mormon westward migration worth using in their General Conference talks, it was probably a valuable book to read. And I wasn’t wrong. President Hinckley described Mr. Stegner as “not a member of the Church but a contemporary at the University of Utah who later became professor of creative writing at Stanford and a Pulitzer Prize winner. He was a close observer and a careful student.” From his perspective as an appreciative outsider, Mr. Stegner compiles this story of our forebears’ journey from Nauvoo to the Great Salt Lake Valley. It spans the years from Joseph’s martyrdom in 1844 to the early 1860s, when the coming of the Transcontinental Railroad changed the face of westward travel and rendered wagon trains and handcart companies all but obsolete. The Gathering of Zion is the story of our forebears, whether our literal ancestors or our spiritual progenitors, and one I am proud to claim. “The Mormon family and the beliefs that sanctify it are…sources of a profound sense of community, an almost smug satisfaction. These people belong to one another, to a place, to a faith.” Reading their story gives me hope that we can draw on their examples and achieve that sense of community and belonging in our own Zions today.